Gmail is a an important free and excellent web based email client which is provided by the Google. Gmail is free to use and easily accessible from any web browser around the world. Lot of time we need to sort and view only unread email messages. 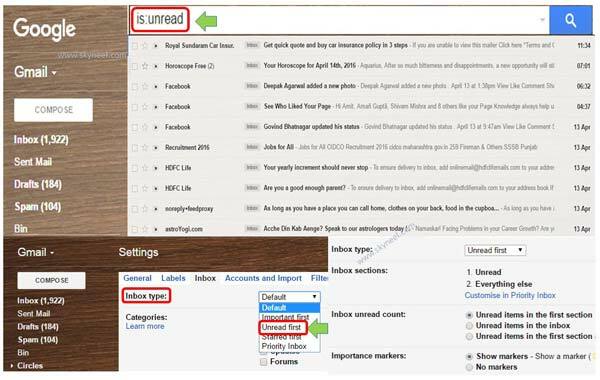 You have to face problems during find all unread emails in Gmail account. Now, you just read this article to easily find unread emails in Gmail account. You have to use simple search method which helps you easily show and find all unread email messages in Gmail account. There are billion of users around the world who have to use Gmail account for sending the email messages, attachments to others. All we know Gmail has Inbox, Sent Mail, Drafts, Spam, Starred mail, chats, spam and different kind of labels. You can easily manage your Inbox emails, labels as per your need. Gmail inbox has different inbox types like “Default”, “Important First”, “Unread First”, “Starred first” and “Priority Inbox”. Sometime there are lot of unwanted email messages coming from different email accounts. Due to which your Gmail Inbox is full with all these unwanted and unread email messages. If you have lot of unread email messages in your Gmail account and want to sort all unread email messages then you just ave to take following few simple steps. This article helps you to quickly find all unread emails in Gmail account. Step 1: Open your Gmail account in which you to find all unread emails in Gmail account. Step 4: Press or hit enter button to view all unread email messages. Step 1: Open your Gmail account in which you want to find all unread emails in Gmail account. Step 2: Click on the “Settings” icon which is located top right corner of your Gmail account. Step 3: Click on the “Settings” command. Click on the “Inbox” tab and choose “Unread first” option in the Inbox type. After reading this article you will be able to easily sort and find all unread email messages in Gmail account. All Gmail users has the ability to quickly and easily find, view, delete, move into any folder and many more all unread email messages of your Gmail account. If you have suggestion regarding this article then write us in the comment box. Thanks to all.